This Guild 12 string has started to rattle badly across its bridge saddle. On close inspection it appears that the bridge is raised. This fault is caused by the soundboard bulging or bellying in an area just behind the bridge. This is the rotational cause and effect of the bridge twisting under string tension and rising up at the back-end causing the string to lose its break point at the saddle. 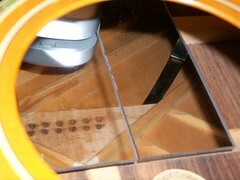 A classic example is the soundboard bellying behind the bridge and the soundboard sinking in front of the bridge. 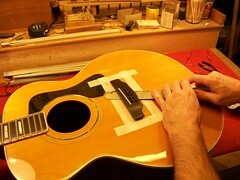 These problems can manifest themselves as poor intonation or string rattle across the bridge saddle. If left unchecked it could result in the bridge lifting and becoming unattached. On this fine old Guild the neck angle is as it should be. The soundboard seems to be fine with no loose struts. 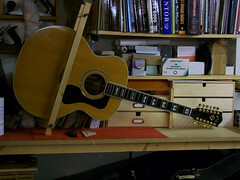 In reality, because this is a 12 string the soundboard thickness and struts are massively engineered. However, the bridge-plate could be at fault as it seems a little undersized to be of any great benefit. 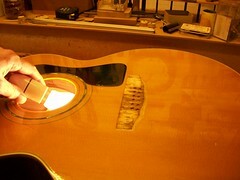 With some bridge-plates, over time and with excessive string tension and humidity changes, the glue can start to creep resulting in the plate splitting and going out of shape. In this case the bridge-plate is made of Curly Maple (odd choice) with the grain running along its length. As all the other possible causes seem in order, the way forward is to remove and replace the bridge-plate with a slightly thicker and heavier plate made of a stiffer hard-wood. * The bridge-plate is a wooden reinforcing patch that is glued to the soundboard directly under the bridge. It has the task of stiffening that part of the soundboard directly under the bridge and helps to counteract the twisting force from the bridge. 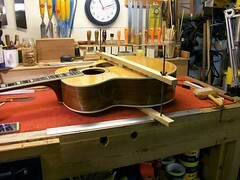 Also it reinforces the soundboard area where the bridge-pins and string ball-ends lock into place. Hello. I have a 12 string Harmony H1233. I believe it has a belly bow like you show in your video. I am curious what you charge to do this repair. Email a few snaps of the problem and I’ll get back to you. Hello GRAHAM, I HAVE THE SAME GUILD JF-55 GUILD 12,STRING IN NEED OF A NEW BRIDGE THAT IS CRACKED AND IT HAS BELLY BULGE ALSO. THE BRIDGE WAS PULLING AND I TOOK IT TO A GUITAR SHOP WHO FIXED IT BUT I LATER NOTICED THE CRACK AND THE BULGE. I CANT PROVE THEY DID IT DURING REPAIR BUT THEY DID. REGARDLESS I NEED IT FIXED. ITS A BEAUTIFUL GUITAR AND I NEED SOMEONE EXPERIENCED TO REPAIR IT. CAN YOU TELL ME WHAT IT WOULD COST TO REPAIR AND THE BEST WAY TO GET IT TO YOU THE QUICKEST? Thanks. Rob Johnson Salt Lake City, Utah. It’s probably best to email me at grahamparkerluthier@yahoo.co.uk to discuss the issues and logistics less publicly. My guitar also has a negative bow. How can I soak the bridge-plate? Can I use water for this?